The vendor landscape of the global cast iron cookware market is primarily characterized by a high level of fragmentation owing to the presence of several multinationals as well as a large number of unorganized domestic players in key regional markets. Increasing competition among key players is the main challenge for cast iron cookware manufacturers, which is likely to lead to a decrease in profit margins. As competition intensifies in this sector, with price wars raging among leading players, industry players are expected to put increased focus on improving the efficiency of their value chain, from inbound logistics to distribution, and to a large extent, the marketing and export of products. Additionally, companies are also trying to introduce a range of differentiated products and packaging for a high margin business segment, in order to cater to the evolving needs of customers, along with enhancing their customer base. Some of the leading companies in the market are Tramontina USA, Inc., The Coleman Company, Inc., Lodge Manufacturing Company, FINEX Cast Iron Cookware Co., Staub USA, Inc., and Le Creuset of America. 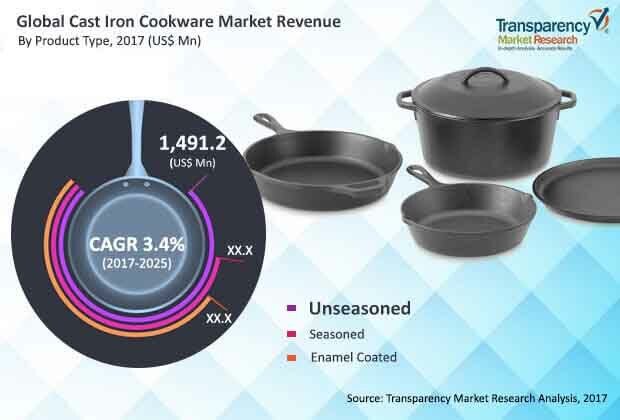 According to the report, the global cast iron cookware market is likely to expand at a CAGR of 3.4% from 2017 to 2025, rising from a valuation of nearly US$2,537.0 mn in 2017 to nearly US$3,303.0 mn by 2025. Of the key end-use consumer segments of cast iron cookware, the segment of food services accounted for the dominant 67.6% share of the overall market. Geographically, the market in Asia Pacific is likely to dominate the overall market in terms of demand through 2025, followed by the markets in Europe and North America. The increasing one-person households across the globe is a substantial global demographic change having extensive consequences, and is having deep implications on a number of businesses ranging from housing to healthcare. This trend is also expected to lead to a surge in the global demand for cast iron cookware in the near future. Over the last few years, consumer behavior has drastically changed and consumers are more inclined towards researching about products online and purchasing various types of cookware such as such as electric, non-stick, and cast iron cookware through e-Commerce websites. As such, the increased awareness regarding the health issues associated with coatings on non-stick cookware and aluminum products and the flourishing market for online retailing are boosting the cast iron cookware market. Moreover, unique properties of cast iron cookware such as high durability, effective heat distribution, and the fact that cast iron cookware leach iron into the food during the cooking process, which may be helpful for iron deficiency problems, are also working in favor of the market. One of the key challenge that is restricting the adoption of cast iron cookware is the fact that cast iron cookware is much heavier than cookware made from other materials such as aluminum and stainless steel. Furthermore, cast iron cookware is not recommended for use on glass cooktops. Glass stove tops require more careful use than coil tops and dragging the heavy cast iron cookware over glass cooktops can scratch the glass surface. Moreover, cast iron cookware is slow to absorb heat, and may damage the heating elements or break the glass stove top. Cast iron cookware with enameling at the bottom is equally unsafe on a glass cooktop. Furthermore, the global cookware market offers several alternatives such as aluminum, stainless steel, copper, and non-stick cookware. Stainless steel cookware are non-reactive, durable, and resistant to rust, dishwasher safe, corrosion, scratching, and denting. They last well and can be cleaned with heavy brushes or dishwashers without damage. Moreover, low cost of these alternatives could also challenge the overall cast iron market.